Few creatures are as feared and misunderstood as spiders. For the most part, spiders are harmless and generally beneficial by keeping the insect populations in check. Spiders are seldom aggressive and bite only when threatened or injured. Few spiders bite people and the venom of most is harmless. However, the bite of the black widow and the brown recluse (also known as the Recluse or Fiddle Back) can be quite dangerous. 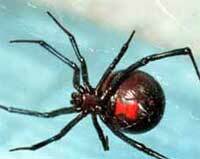 Beneficial or not, if spiders become a pest you need to eliminate them.. Most infestations require both methods. And remember, the better you understand any pest, the easier it will be to eliminate or control. Spiders are the largest group of arachnids. There are more than 35,000 named species worldwide, including about 3,000 in North America, but probably most spider species are still awaiting identification. When someone brings a spider to us for identification, it is usually large (which makes one believe it might be a Tarantula) or is marked with brilliant colors (which many believe might be a black widow), but most spiders that we are asked to identify are harmless. Spiders are easily recognized by the 4 pairs of seven segmented legs and (like all arachnids) have a cephalothorax and abdomen. But unlike scorpions, mites and daddy-long-legs, the cephalothorax and abdomen of the spider are separated by a visible waist or pedicel. The top of the cephalothorax is protected by a shield-like covering called the carapace. Ant, Roach & Spider Killer Aerosol Spray - 15 oz. Spider & Ground Bee Killer 10 oz. Warning Web for Birds by Droll Yankees - 2 pk. Houseplant Systemic Granules 8 oz. Zodiac Fogger - 3 pk. Total Pest Control Indoor Concentrate 5.4 oz.